Is January anyone's favourite month of the year? (Answer: no). Christmas and New Year's Eve are over, so it's tough to find something to look forward to when all you've got is more dark months and the chance of icy weather ahead. But we have some incredible news for you: There's one way to make your 2017 a little brighter, and it's all thanks to a trend that our favourite people on Instagram are doing. The pink wall has dominated our Insta feeds of late. If you don't know what we're talking about, we'll explain. From Karlie Kloss to Jeanne Damas, fashion girls all over have been posing in front of pink walls. And it looks amazing. Not only is this colour super flattering (pink tends to make everyone's skin look soft and romantic), the hue, in its many shades, is just what we needed to give our own Instagram feeds a refresh. So if you're looking for a way to revamp your account and look seriously stylish int the process, then we've got just the idea. Don't believe that this is a chic look? 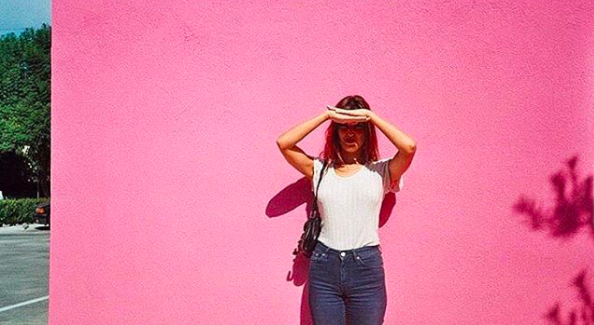 Click through our gallery below for the best pink wall poses on Insta right now. If French It girl Jeanne Damas is doing it, then we're already sold on the idea. This is just reason #12589 to be obsessed with influencer Maja Wyh. Not only does she constantly wow us with her outfit ideas (she's always wearing the latest Vetements), she's also got the pink wall trend down. We'd argue that a lot of the reason why we're so obsessed with pink (other than Gucci) is brand Mansur Gavriel's gorgeous mules. Its insta feed is full of incredible pink walls too. Trust blogger Susie Bubble to be in on this look too. We especially love the dusky pink wall contrasted with her hot pink Miu Miu slippers. Creative director of shoe brand Brother Vellies, Aurora James, poses in a cute off-the-shoulder dress against a pink backdrop. Extra points for two different shades of pink going on here. Fashion blogger Ina Becker does the pink wall well with a subtle contrast of a white tee, jacket, and jeans. What's not to love about this beautiful floral look? Hats off to Shiona Turini, contributing editor at The Cut for this. Take note: This is the so-hip-it-hurts way to do the pink wall trend. We'd be this happy if we were wearing this much pink too. Karlie Kloss rocked this style months ago. Want more styling ideas? This is the biggest trend on Pinterest right now.